Uncategories When no visa required for 7 visits across the zero line…!!! I am settled in a town which is just 10 km from the zero line of international border touching Pakistan. 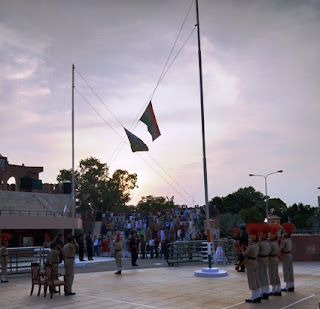 Normally, the visit to this place is not occasionally and only when someone visits our place as this is the only place or part of your schedule to entertain your guests, where one can take them to witness Retreat Ceremony at Hussainiwala border – a ceremony of lowering of flags of both the countries in the evening with full state honours. Really, all the time, you enjoy the gestures of the sentinels – Rangers from Pakistan side and Jawans of India – during the Retreat Ceremony parade. One could enjoy the thunderous tapping by the jawans in nicely dressed in official uniform, matching every step, every action with their Pakistani counterparts with a view to outdistance them. Great enthusiasm is seen among the audience of both the countries to encourage the sleuths guarding the international border 24x7. Everyone has an intense feeling of patriotism, a spirit of sacrifice and naturally a hatred for the men on the other side. These guardians of the national march back to their barracks with the folded national flag on the arms to keep it safely for hoisting in the next morning. Though I was born three years after the partition in 1947, yet our parents, grandparents and old-timers had shared their stories of revolutionary activities going on in India ruled by the Britishers. It was a political decision to bifurcate the two communities otherwise people of both the countries still love to lift the man-made barriers, if possible to reunite the country. My last visit to the zero line had a different experience and feeling. Really, for the first time visitors, it is definitely a conventional rituality, for some it might be a drill by soldiers showing respect to the National Flag and for some there is anxiety to see the people on the other side and for some others it is important to see the ‘zero line’ which is much talked about during the war days. I cannot forget my this visit at this time, I was not paying my attention to the show off of the soldiers as our guest who has come for the first time. My eyes were set on the squirrel which was moving along the zero line. In general, the ground-dwelling squirrel species are social, often living in well-developed colonies, while the tree-dwelling species are more solitary. Since squirrels are known for using complex systems of high-frequency chirps and tail movements and it gets a lot of attention from humans, but not always much appreciated. But the squirrel has often the entertaining history of living in our midst. I noticed across the zero line that a Pakistani child has thrown something eatable on the ground and within a fraction of second; the squirrel paid seven frequent visits across the zero line to grab the food from the floor. Frankly speaking, the feelings which come to my mind instantly were – while there are restrictions on men to visit countries of each other side that too with the valid visa process. But the seven visits of squirrel did not require any such formality as if they were like little furry forest ambassadors and using the trees along the international border as their urban embassies.